Moeen Ali hopes to be made available for Worcestershire's final two matches of the season following the conclusion of England's summer programme. Having emerged as a Test-class spinner this summer, the England all-rounder is now part of the limited-overs squad playing ODIs and a T20 against India. But he would be free to return after next Sunday's T20 at Edgbaston. 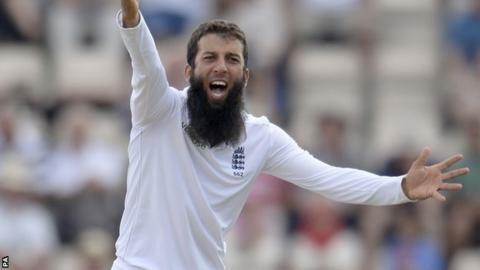 "If England allow me, then I would love to play in the last two games," said 27-year-old Moeen. "Surrey and Essex will be two tough games. They are also in contention and we've got to play well and hopefully bang out the runs and the wickets." After getting a rude awakening when they suffered their first Championship defeat of the season at home to Gloucestershire in their last game, Division Two leaders Worcestershire return to action with a trip to Derby on Sunday, prior to the games at home to Surrey (9-12 September) and against Essex at Chelmsford (23-26 September) . "I know we had a bit of a tough week," said Moeen. "But that kind of stuff happens. We've had such a good season. Now hopefully we can finish well." Moeen reveals that he has used England's team operations manager Phil Neale, the former County Championship title-winning Worcestershire captain, to keep him up to date with his team-mates' progress throughout the season. "We can't have our phones on during the game," he said. "But I get Phil Neale or anyone to check out the scores for me. "Worcestershire is part of me and I follow almost every single session every day. It's nice we've been winning so many games throughout the summer." Moeen, now on an England increment contract, was given permission by the ECB - between the end of the Sri Lanka series and the start of the India series - to play in a Championship match against Glamorgan back in June, which Worcestershire won. But the county were then disappointed when they failed to get Moeen back for the T20 Blast quarter-final against Surrey at The Oval in early August (between the third and fourth Tests), which Worcestershire lost. Shrewsbury-born Clarke, 18, who made his Minor Counties debut for Shropshire at the age of 16 two summers ago, has been on a summer scholarship deal with the county in 2014. He was scheduled to switch to a full contract in 2015, but that contract has now been extended by a further 12 months, tying him to New Road until the end of the 2016 season..
Clarke, is the sixth product of the county's academy system to commit their future to the club for the next two years this month, following the lead set by Joe Leach, Chris Russell, Tom Fell, fellow wicketkeeper Ben Cox and Tom Kohler-Cadmore.